Dassault’s newest business jet, the Falcon 6X, was revealed this week as the latest model from the Falcon family line. The Falcon 6X is a replacement for the 5X, a lengthy project that was cancelled due to several delays in its engine development. The brand new Falcon 6X is similar to the 5X in many ways, however has some notable differences. The cabin in the 6X has 20 more inches of space that allows for a larger aft lounge, larger galley, or a dedicated crew rest area. With more available space, passengers will have more room for privacy and relaxation. A cabin air filtration and circulation system unique to Dassault keeps fresh air circulating throughout the cabin, creating a much more comfortable environment for passengers. Additionally, the Falcon 6X has impressive noise cancellation, allowing for normal conversation amongst passengers. The twinjet will have Pratt & Whitney Canada engines, each equipped with 13,460 pounds of thrust, that have already recorded more than 20,000 test hours. The 6X will have a top speed of Mach .90 and a range of 5,500 nautical miles, 300 more than the 5X. 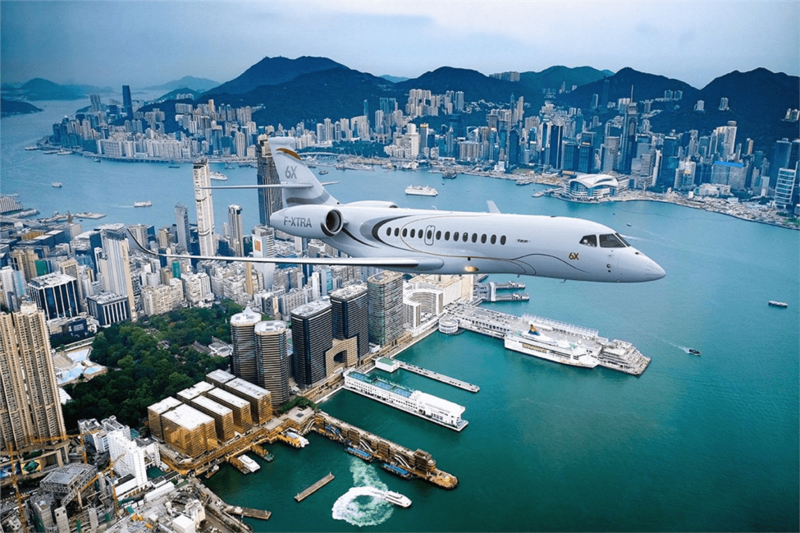 Although Dassault did not anticipate the 5X program to be prolonged to the point of cancellation, customers have responded excitedly to the 6X. The 6X will be priced at $47 million, about the same as the 5X. First deliveries of the jet are scheduled for 2022.